“H is for holes―old and new, and here are some holes I’m sharing with you.” Holes―here, there, and everywhere and a magic hole that disappears! The little girl in this delightful story shares some of the holes in her world and shows just how different holes can be. While “The Hole Story” is meant to raise awareness, boost confidence, and put smiles on children’s faces, it promises minutes to hours of a fun-filled activity. We’ve all heard about different kinds of animals and various creatures escaping from zoos where gates, for reasons unknown, have been left open. 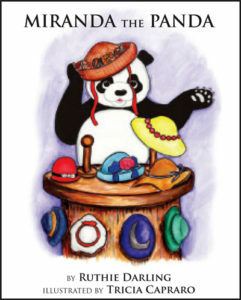 In this little fantasy, Miranda is bored with her daily life of sleeping, playing and eating bamboo. When she sees that the zoo’s cage has been left open, she decides to take a trip into town! Share in Miranda’s fun and see what she has learned by the time she returns to the zoo! 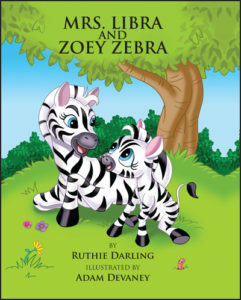 Zoey the Zebra wants to change her stripes on her face. She goes into the world to find other stripes to add to hers. Her mother, Mrs. Libra, who is sure this cannot be done, goes with her to protect her and at the same time allow her to feel that she is able to think for herself. While it is a children’s tale, adults can learn from this delightful little book as well. We invite you to visit Ruthie’s Facebook page to find out about upcoming events and special appearances.